Shuren "Shuren of the Flames"
Shuren of the Flames (炎のシュレン, Honō no Shuren?) is the Leader of the Goshasei's Crimson Army and uses a style which allows him to manipulate fire. After Hyui's death, Shuren challenges Raoh to avenge Hyui's death. 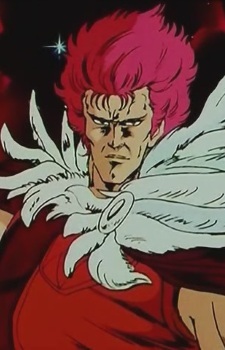 He uses the suicidal Gosha Enjōken ("Five Chariots Passionate Flame Fist") technique, which engulfs his entire body in flames, but proves to be ineffective against Raoh.